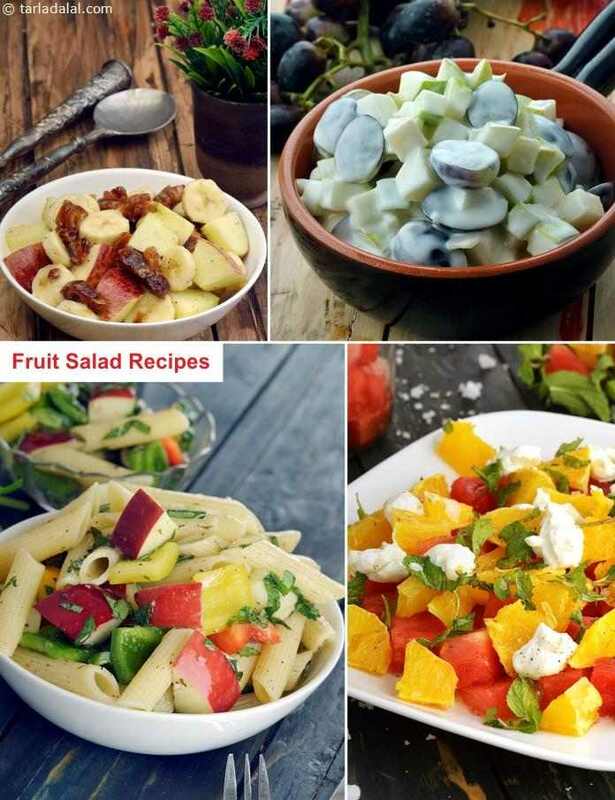 Enter this section to discover a world of Fruit-based Salads, made using fruits, or a combination of fruits with vegetables and pulses. Delightful creations like the Fruit Chana Salad can accompany your starters, while those like the Pear and Pomegranate Salad can make a tasty dessert. Whatever be your requirement, you’re sure to find a salad that’ll fit in! I often turn to Fruit Chana Salad delightful salad when i have leftover chick peas and a basket of fruits in the refrigerator. The chick peas have a wealth of nutrients like energy, Protein, Calcium Rich Recipes and Iron while the orange segments abound in vitamin c which helps to enhance our resistance to diseases. Feel free to replace orange and pomegranate with fruits that are handy or fruits you love the most, taking care to avoid ones like mangoes, bananas etc.